Graduate student forward Bo Zeigler drives to the hoop during men's basketball's game against Hampton Saturday. Since its season opener 10 days ago, men’s basketball has gone 2-1, relying on different contributors to keep the team ahead or in contention at each contest. Although the Colonials play only about seven men deep, seven different players have scored at least nine points in a game and no one person has led the squad in scoring in more than one contest. Head coach Maurice Joseph said the team’s interchangeability and ability to attack in different ways helps make up for its youth and relative lack of depth early in the year. No member of the Colonials has experience in the scoring spotlight after former forward Tyler Cavanaugh’s eligibility expired last season and the team lost more than 70 percent of its offensive production in the offseason. Coming into the 2017-18 season, senior guard Yuta Watanabe was expected to take over some of the lost scoring load as the only player with more than one year of experience in Foggy Bottom. He averaged 12.2 points per game last year, but focused more on his defensive skills. 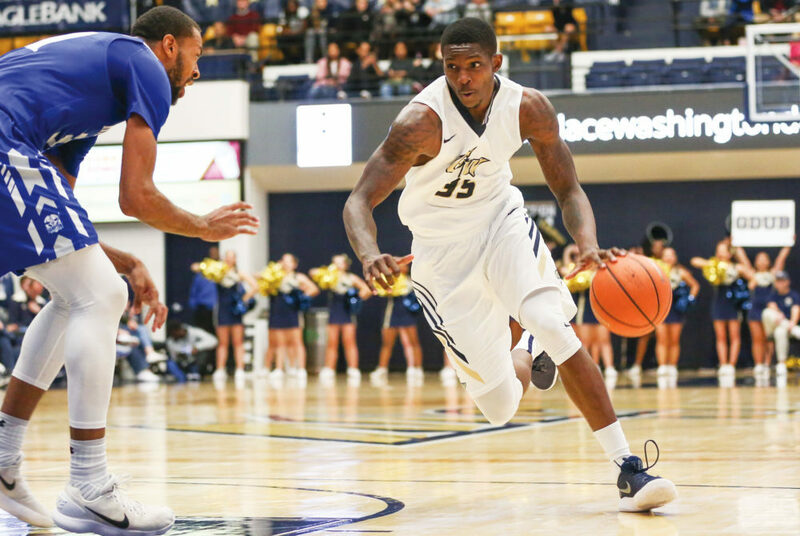 In the first game of the season against Howard Nov. 10, Watanabe embraced the scoring role and led GW with 19 points on 8-of-11 shooting from the field. Despite Watanabe’s performance, Joseph said he was pleased to see that other Colonials were able to find the back of the net against the Bison. The team took advantage of a tightly called game and a struggling Howard interior to control the paint. Graduate student forwards Patrick Steeves and Bo Zeigler and sophomore forward Arnaldo Toro each added double-digit scoring totals in efficient performances. In GW’s loss to Florida State Tuesday, a repetition of the strategy against Howard would not have worked. The Colonials were outmatched in the paint and Watanabe struggled to knock down shots, but they found other ways to keep the game within striking distance. Joseph said the Colonials adapted to the Seminoles defensive strengths, which allowed them to cut the differential to 10 points in the second half. Freshman guard Terry Nolan Jr. scored a game-high 18 points in his second college game to match 18 from sophomore guard Jair Bolden. The starting backcourt duo was able to get to the rim, despite GW’s difficulties sustaining its runs. Bolden has been the closest the Colonials have to a go-to scorer thus far. He averages 16.0 points per game and is the only GW player that has scored double-digits in each outing. He has played nearly 35 minutes per game – second behind Watanabe with nearly 38 minutes – a steep jump after averaging less than 18 minutes last season. But Bolden, now in an everyday starting spot, said he is poised for the increased role. The Colonials’ Saturday victory over Hampton was their lowest-scoring contest of the year, but featured Steeves and Bolden combining for 27 points and sophomore guard Justin Williams using his athleticism to find openings in the Pirates defense. Williams scored a career-high nine points during the game and played 19 minutes – the fifth-most on the team. Joseph said his showing – although unexpected after previously tallying just four career points – was earned through weeks of hard work. Throughout all three games, GW has struggled to knock down shots from distance, shooting a 17-for-61 clip on the season. With a shorter team, players said they are looking to become more consistent from three-point range so they can spread out larger defenses.